In the book "War Against the Weak: Eugenics and America's Campaign to Create A Master Race" by Edwin Black, the author's central thesis is that Nazi racial hygiene and its ultimate manifestations in the Holocaust were imported in detail from the USA, and that, indeed, it was US ruling elites who hatched the idea of creating a master Aryan race by selective breeding and then passed it along to the National Socialist German Workers Party. In Zweites Buch (Second Book), Adolf Hitler portrayed the U.S. as a "racially successful" society that used eugenics and segregation and followed what Hitler thought was a wise policy of excluding "racially degenerate" immigration from eastern and southern Europe. It was a change from Mein Kampf and what caused the change in Hitler's views between 1924 and 1928 is not known. By 1928, Hitler seems to have heard about the U.S.'s massive industrial wealth, the Immigration Act of 1924, segregation, and the fact that most American states had eugenics boards to sterilize people who were considered inferior. Hitler declared his support for such practices and desired that German socialists would follow suit. Was Hitler also aware of the Nazi salute and robotic chanting that was used in the U.S.'s Pledge of Allegiance and had been so for about 3 decades? Edward Bellamy and Francis Bellamy (Edward's cousin and cohort) were conspiracy theorists and socialists. Edward Bellamy's conspiracy theories were outlined in his books, including the novel "Looking Backward" an international bestseller that Bellamy personally had translated into German, where Bellamy had lived for a year. Bellamy's book launched a global movement of national socialism. The Bellamys believed that countries would be destroyed by diversity and individuality, unless the government imposed uniformity and "equality." The National Socialist German Workers Party (Nazis) adapted the straight-arm gesture, along with robotic chanting to flags and government. Yet, to this day, conspiracy theories that question government action are shunned, while conspiracy theories that tout government action, and even all-out war, are embraced and repeated. American socialist eugenicists, as explained by various authors including Edwin Black. Hitler personally communicated with and lauded American socialist eugenicists. The automaker Henry Ford and his book “The International Jew” and his Dearborn, Michigan newspaper. James D. Mooney, vice-president of overseas operations for General Motors, also received a medal from Hitler, the Merit Cross of the German Eagle, First Class. The early silent movie "The Vanishing American" (by George B. Seitz) based on the Zane Grey novel that shows the American stiff-armed salute taught to native Americans in a government school. And other American movies. American books and writers. See “Hitler’s Private Library: The Books That Shaped His Life” by Timothy W. Ryback, including the book by American eugenicist Madison Grant titled “The Passing of the Great Race.” Karl May, the German author who was one of Hitler's favorite authors and whose books were set in the USA as cowboy and Indian westerns. Ernst Hanfstaengl, an American and a Harvard grad and an intimate friend of Hitler known as “Putzi” and “Hitler's piano player” and who advised Hitler on how to lead a crowd into adulation and loyalty (e.g. as was -and is- done with the Pledge of Allegiance and its early Nazi salute). Via the Olympics, including the 1924 Olympics which displays the stiff-armed salute that the Olympics adopted from the USA's Pledge of Allegiance. News reports and court cases concerning pledge persecution that reached its nadir at the U.S. Supreme Court in 1940 in Minersville School District v. Gobitis when the Court upheld government persecution of children in government schools (socialist schools) if they refused the daily robotic brainwashing. Woodrow Wilson wanted all children to chant the pledge, during the time when America's nazi salute was used, during the time he was president and during WWI. Wilson is also quoted in the film “Birth of a Nation” explaining the goals of the “Aryan” people. A fan of RexCurry.net writes: The association of the pledge with the National Socialist German Workers' Party is at least skin deep. The stance, presentation, salute and pledge of allegiance were essentially the same. The American pledge (1892) does predate the National Socialist German Workers' Party (1920) by some 28 years. The extended arm salutes varied a bit over time but was essentially the same. 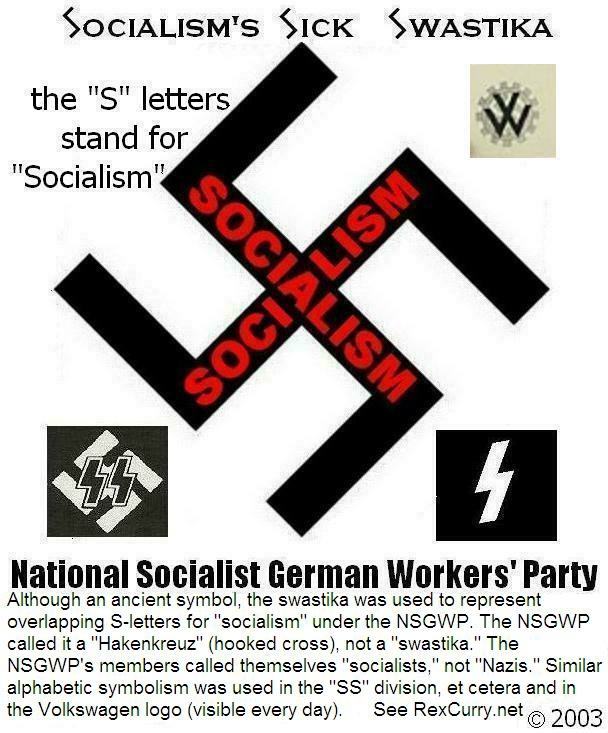 So did the National Socialist German Workers' Party copy American socialists? It is also significant that at that time (1899), John Dewey, author of Democracy and Education, was leading a campaign to turn US public education into an gigantic propaganda mill for international socialism. Afterwards the U.S. Bureau of Education wrote, "The public schools exist primarily for the benefit of the State rather than for the benefit of the individual." This at a time when Germany too was overhauling its school system. But these were not the only connections with the pledge. Vermont social scientists in the 1920s and '30s devised a plan to eliminate the state's "degenerate" bloodlines and replenish "old pioneer stock. The 12-year survey was developed by an independent team of social scientists who studied "good" and "bad" families in the state and listed those which it determined needed to be *eliminated*. The report was circulated among policymakers at the time and led to the passage of a 1931 sterilization law. Yep. The earlier work of Dewey and Bellamy had paid off! The kids were now grown and thinking like true socialists. The science of human breeding had branched off from social Darwinism. Eugenics was front stage. Visit the archives at the Boston Globe, 1999, for details. This law resulted in the sterilization of several hundred poor, rural Vermonters, Abenaki Indians and others deemed unfit to procreate. The model was soon adopted by other states which over the years effected thousands of Americans. Sound familiar? So how is this relevant? Because the women's suffrage movement of the latter 1800s had become a socialist enclave which expanded the idea of birth control to population control. "We, too, recognize the problem of race building, but our concern is with the quality of our people, not with their quantity alone." So, that committee was aware of the goal of the leader of the National Socialist German Workers' Party to decrease quantity while improving quality. They differed only in priorities. Yep. That's THE Planned Parenthood. A leading feminist at this meeting and a member of the American Eugenics Society, Margaret Sanger, attracted the attention of the leader of the National Socialist German Workers' Party who invited Sanger to Germnay to discuss some ideas. So, one bad deed leads to another. Each stage sets the stage for the next generation. Words mean things. There is an "Annual Margaret Sanger-KKK rally art contest." In the past, entries have included photoshopped "recreations" of Sanger's actual work. "Always to me any aroused group was a good group, and therefore I accepted an invitation to talk to the women's branch of the Ku Klux Klan...In the end, through simple illustrations I believed I had accomplished my purpose. A dozen invitations to speak to similar groups were proffered." Eugenics led directly to the birth control movement. All the same players were involved, such as Margaret Sanger, who was a member of the American Eugenics Society and was the editor of the Birth Control Review. The primary philosophy was trumpeted on the cover of the Birth Control Review: "More Children for the Fit. Less for the Unfit." She made it clear whom she considered unfit:. "Hebrews, Slavs, Catholics, and Negroes." She set up her Birth Control clinics only in their neighborhoods. She openly advocated the idea that such people should apply for official permission to have babies "as immigrants have to apply for visas." She admired Adolf Hitler, and while he didn't care for Americans much, he liked her too. The announcement for the 3rd Annual Margaret Sanger at the Ku Klux Klan Rally Art Contest! are posted at The Truth About Margaret Sanger. Unlike the past two years, photoshopped entries will not be accepted. However, contestants may submit "Drawings, cartoons, historical novels, haiku, dance, plays, videos, paintings, quilts, rap, puppetry, modern interpretations of Sanger speaking to the Klan, reenactments of the speech on YouTube, mime, audio recordings of actual Sanger quotes she may have reused when speaking to the Klan -- there is no limit to the artistic ways this historic event can be commemorated." The Aryan Path Magazine - Published 1930 Theosophy Co., Ltd. Page 55 "...a 'Religion of Solidarity,' as it was called by Edward Bellamy, will not compel alteration of a self-centred programme of living." From Theosophist Magazine September 1934-December 1934 (under Annie Wood Besant) - page 323 THE BELLAMY PLAN A copy of the August issue of THE THEOSOPHIST, containing an article on my husband, Edward Bellamy, written by Fred Bell of the Bellamy League in South Africa, has just reached me, and I desire to extend my thanks to you for sending it. Many of Mr. Bellamy's most ardent disciples throughout the world are Theosophists, and this article, we hope, may be the means of calling the attention of others to the beauty and the soundness of his economic philosophy towards which the world seems now to be steadily moving. (Mrs.) EDWARD BELLAMY. The United Nations now regards forced sterilization as a crime against humanity. Bellamy typified how political utopias were reformulate in biological terms. Social reformers were convinced that if science and medicine were judiciously applied, utopia was within mankind's grasp. Ellis wrote this, but it could as well have been written by a member of the National Socialist German Workers’ Party advocating the purification of the ‘Aryan’ race. Ellis sees ‘quality in human production’ as a ‘noble ideal’ and necessary for socialism to ‘continue on its present path’. And continue it certainly did. Here we see what F.A. Hayek calls ‘the fatal conceit’ of socialism in deeming itself the agent for ‘amelioration of the human lot’. Here we also see the absolutely evil perversion of the meaning of language: socialism and eugenics are claimed to be components of humanism. Another notable whose ideological proclivities are not talked about is H.G. Wells. Remembered today only as a famous writer of science fiction, he was a member of the Fabian society which led the socialist political movement in the first part of the 20th century. The Fabians included the famous – or infamous, depending on where one stands on the issue - Sidney and Beatrice Webb and George Bernard Shaw. In 1902, H.G. Wells published a work titled: “Anticipations of the Reaction of Mechanical and Scientific Progress Upon Human Life and Thought”. The last chapter in this book is named “The Faith of the New Republic”. Margaret Sanger, EUGENICS http://rexcurry.net/edward%20bellamy.jpg EDWARD BELLAMY & Francis Bellamy conspiracty theorists, conspiracy theory, conspiracy theories. From the news 07/10/09 Exhibit at Germany's Bach Museum probes Nazi influence on music: Richard Wagner is the classical composer most associated with the Nazis, but Johann Sebastian Bach was the one the party dubbed "the most German of Germans" and whose music was played at rallies where "Heil Hitler" was chanted, to stir up nationalist zeal. By the time Ernst Hanfstaengl was attending school in the U.S., the American straight-arm salute was used for various purposes, including the National Anthem (the Star Spangled Banner), for school flags, and even as a general greeting or cheer during sports events (including Harvard football games).